(Nanowerk News) Tiny cages shaped like honeycombs, but ten million times smaller in size than actual honeycombs, are effective at reversibly trapping and releasing single atoms of inert argon gas. The capture and release can be done at room temperature. The cages, only half a nanometer in size, are made of Earth-abundant elements silicon and oxygen (Nature Communications, "Immobilization of single argon atoms in nano-cages of two-dimensional zeolite model systems"). Capturing and holding single atoms of inert gases “in captivity” allows them to be investigated in detail. It lets researchers learn more about the gases—especially how they act when confined in small spaces. These cages have significant potential impact for capture of rare gases. For example, the cages have potential use in nuclear waste remediation, which requires trapping inert radioactive gases. Single atoms of inert argon gas were trapped at room temperature in silicate nano-cages, which are formed as 2-D honeycomb-like arrays on a surface. This is a remarkable result because inert gas atoms interact only very weakly with their surroundings and are hard to “catch” without resorting to extremely low temperatures. 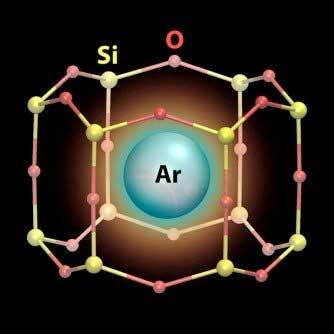 Their capture by 2-D silicates is facilitated by each cage being just the right size to hold a single argon atom. This discovery has implications in fields as diverse as nuclear waste remediation, development of molecular sieves, and radiological medicines. Researchers carried out these experiments using the ambient pressure photoelectron spectroscopy instrument, operated jointly by the Center for Functional Nanomaterials and the National Synchrotron Light Source II at Brookhaven National Laboratory. The team used density functional theory calculations to identify the preferred landing spots for argon atoms within the nano-cages and to gain insight into the rare gas adsorption/desorption mechanism. The team performed large-scale parallel computer simulations using resources at the Center for Functional Nanomaterials and the National Energy Research Scientific Computing Center.